« Merry Christmas! Feliz Navidad! Mele Kalikimaka! 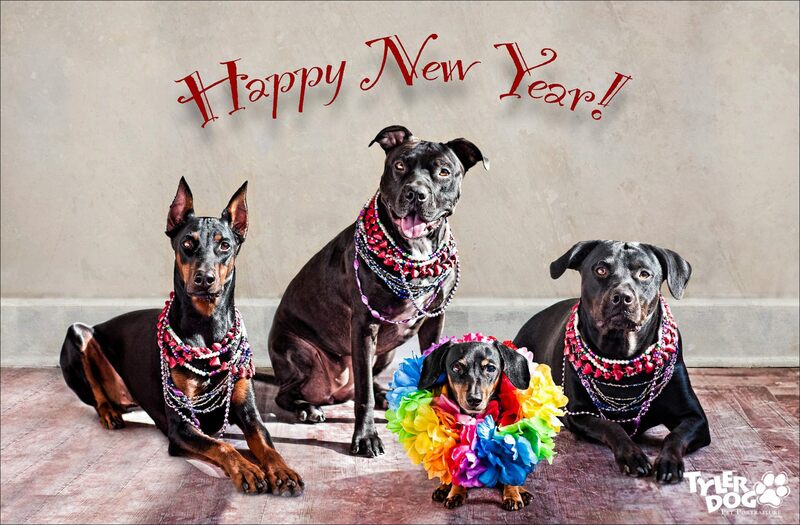 Happy New Year from Dopey Katie, Big Head, Jazzy the Amazing Wiener and Maggie Monster aka Katie, Xena, Jazzy and Maggie. Hey all ewe wiener luvers! Happy New Year 2012! Yesserday, Mom spended most of da day takin’ pikchurs ob us for ar “Happy New Year” kard. I tol Mom, “Look, I izunt wearin’ no Mardi Gras beads ‘cuz I nos whut ewe haf to do to get ’em! An besides, Mom, I wanna nos eggactly how ewe gots dem!” She tol me, “Look, little wiener, your Uncle Bernie got those beads for us and I don’t have a clue what he did to get them, but you probably don’t want to know!” I wuz shocked! Den again, it iz meez Unkle Bernie an he iz meez Papa’s dad, so it maked sense. Dey are all goofballs, but I luvs dem anyways ‘cuz dey bees my family! I haf been tinkin’ a lot about whut all dis “new year” stuff is about. Peeple haf been saying on Facebook dat 2011 was hard. Yeah, it wuz. But to be honest, I donut tink 2011 wuz any harder dan, say, 1914, 1929, 1939. All dos yeers had weally bad tings happen. In fact, if ewe look at history, jest about every yeer has sumthin’ bad happen in it. Let’s face it, wiener peeps, bad tings happen no matter what da year. If all wee fokus on is da bad, we will finds it. Sure, it’s hard to see gud wen ur heart has been broken. Or ur drowning in debt. Kan’t find a job. Or a loved one is in da hospital. I remember a heartbreaking phone call I receeved a long time ago, anguish on da oder end, “I’ll never love again!” It wuz my Papa wen he wuz only eight yeers old. Well, he didunt akshully call me. He called my Mom. But she tol me about it. Mom sed my poor Papa was brokenhearted. Third grade, eight yeers old, an he wuz never gonna fall in love again! Mom listened an twied to comfort him best she cud, all da while smilin’ on da oder end because she knew, surely, he would fall in love again, many times. He wud have his heart broken again, many times. An yet, he wud get up anoder day to do it all over again. Why? Because der is gud in dis world. Ewe will win sum. Ewe will lose sum. Ewe will get jobs. Ewe may lose a job. Ewe will get ur heart broken. Ewe will swear never to fall in love again. Ewe will make friends. Ewe will lose friends. Ewe will lose loved ones. It iz true! Da gud an da bad, it’s whut makes us who we are. So embrace the bad an learn from it. Hold on to da gud for all it iz worth an store it up for dos rainy days. An remember, life happens. It iz up to ewe to decide whut to do wid it! Happy New Year! I luv all of ewe! Oh my favorite wiener….You are indeed a very wise doggie. My 2011 was a good year in my heart and mind. I did not lose anyone that I love, my husband still has a job and we both are in good health. For our ages, anyway! Maggie and Reggie both gave us a few scares when they ate stuff they are not suppose to. Both of them had to have ultra-sounds….Maggie two. Both kitties are healthy. They are stinkers, but we love them. I have made many new people (and wieners) on facebook and they are important to me. I expect 2012 will be good too. Thank you for being my friend….you are one special girl!! Mz Dorothy, ewe are one of my favorite peeps! I iz so glad ewe had a gud yeer. Mom kinda had a tuff one, ol’ Tucker died at 14 an she did dat heartbreak ting, too, but I tol her, “Buck up, ol’ girl. Remember, ‘da gud an da bad, it’s whut makes us who we are. '” She tol me to stuff it. BOL! BOL! I luv weading about Maggie an Reggie. Eww shud start a blog called “Da Adventures of Maggie an Reggie!” Dey cud be famus like me! Gif dem both hugs for me am tell ’em be kareful whut dey eat! Tell da kitties I sed hi an enjoy ur new year! Hugs an kisses to ewe!